While many intersection car accidents occur in metro areas like Phoenix, Arizona, where high-density neighborhoods, numerous businesses and pedestrian traffic converge, any intersection can be dangerous. While many intersection car accidents occur in metro areas where high-density neighborhoods, numerous businesses and pedestrian traffic converge, any intersection can be dangerous. In fact, the National Highway Traffic Safety Administration found that 40 percent of crashes typically occur in intersections. Understand the causes of intersection accidents and several solutions as you help to make the roads safer for everyone. 27th Avenue and Camelback Road: 48 crashes and 17 injuries among 61,002 daily drivers, including Grand Canyon University students and staff. 67th Avenue and Indian School Road: 49 crashes and 28 injuries among 69,49 daily drivers, many of whom live in nearby single-family homes and apartments. 75th Avenue and Indian School Road: 51 crashes and 38 injuries among 61,078 daily drivers who travel the city’s long arterial street near Trevor Browne High School and Desert Sky Mall. 59th Avenue and Thomas Road: 53 crashes and 25 injuries among 65,891 daily drivers on this popular commuter road near Cartwright School and several high-density neighborhoods. 67th Avenue and Mcdowell Road: 57 crashes and 27 injuries among 60,468 daily drivers who include commuters avoiding Interstate 10. Just five intersections were the scene of 258 accidents resulting in 135 injuries. As a driver, you can take several steps to more safely navigate intersections and potentially reduce the likelihood of an intersection accident. Proceed cautiously when the light turns green. Be aware of other drivers and pedestrians. Intersection accidents occur frequently and are dangerous for drivers and pedestrians, so use caution as you promote safety. 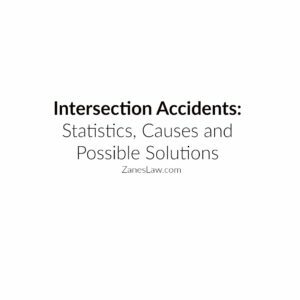 If you are involved in an intersection accident, contact Zanes Law for assistance in filing a personal injury claim.